As I get ready to hit the road once again…how these seven weeks at home and back at my loom have flown! !…I always find it useful and somehow necessary to stop and take stock of what I have done with my weaving time and think ahead to my return so that I can hit the ground running when I get back. The next time I am home it will be for a full luxurious six months, unless I get restless and decide to go visit with my weaving teachers. Several ideas have already come to mind. The first thing I finished when I got home seven weeks ago, was the silk paisley-patterned scarf. If you have been following my blog over the years you will certainly know about my friend Dorinda. She recently left Bolivia to return to her home in the USA after having worked with a group of weavers in the central Bolivian highlands for about a decade. She writes and tells me about her transition back to life in the developed world. It is inspiring for me as I face the the fact that one day, I too, will most likely need to return to my other home in Australia and leave all this behind. This year I celebrate twenty-five years in South America. Leaving seems impossible and the very thought of it breaks my heart. 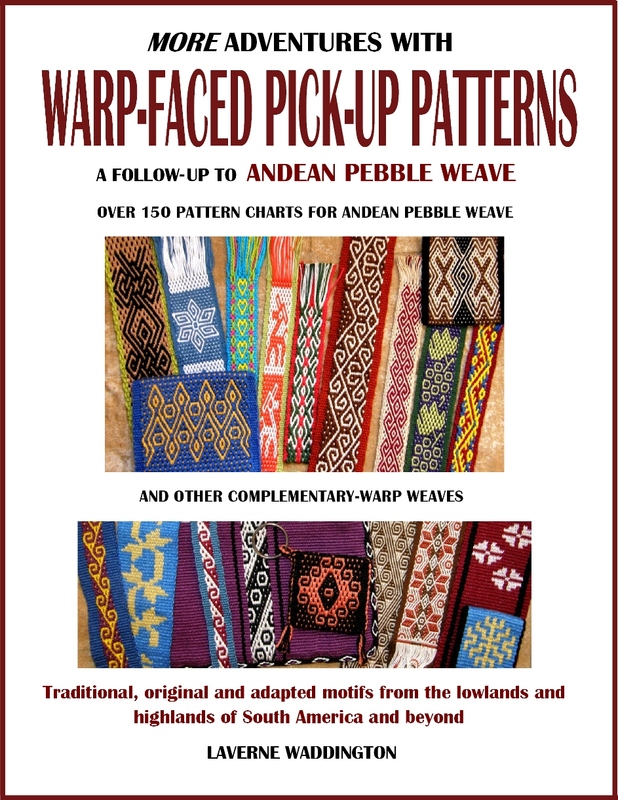 If I could somehow make my home in both countries…..
Dorinda has also been taking stock of many things, one of which is the inventory of woven items she has had brought over from Bolivia recently. Naturally, Dorinda has had a difficult time assuring the weavers she left behind that all is not over and that she will be better able to generate sales for them in the USA than when she was with them in Bolivia. She is eager to give them a new order but funds for materials to create more textiles must come from the sale of existing stock. This is where I am hoping you can help out. Dorinda has with her in the USA a limited number of bands of various width, zippered pouches and straps all created with the weavers’ own handspun naturally-dyed wool. If any of you have woven tubular bands with me, you will be well-acquainted with this beautiful cloth. I have also shown the pieces many times on my blog. Those of you who enjoy working with the hand spun natural dyed woven cloth to make your own creations will be pleased to know that there are 19 fajas/bands ($38) (70” x 5” ) 6 larger weavings ($68) which are 63” x 9.5”, and 12 straps ($18) which are 74” to 78” long and 1.5” wide available for purchase. Photo courtesy of Dorinda Dutcher. There are also zippered pouches…$17 with wrist strap, $16 without, as well as yoga mat straps. Dorinda is particularly keen to promote the yoga mat straps as these are woven by the youngest weavers and sales of the straps encourages themto continue learning to weave from their elders and advance to wider pieces. Read more of the story in Dorinda’s blog post. As for my taking of stock, I am pleased that a couple of the items I completed during this short stint at home will travel with me. I have a new pouch for my iPod and charger as well as a handy neck pouch for carrying my iPod about when I want to use it as a camera. And, I wove a couple of silk bookmarks which are gifts for some friends. On the first one I used patterns that I haven’t woven for years and which I saw during time I spent with Angela, my Guaraní weaving teacher. I got half way through charting these patterns, but found that it was actually faster to just wing it….something which is fairly easy to do in the intermesh structure. I wove the mug rugs pictured above many years ago with one of the patterns and still have three of the test pieces which served as my guide for replicating the motif. It had taken me a few attempts to get the tubular edging on those mug rugs right and the two pieces in the picture were duds. I am not showing the ugly edges of the mug rugs in the picture! I have a large tub of these abandoned pieces under my bed in case you believe that everything I weave turns out well first go! Occasionally I pull them out and they become useful. Speaking of mug rugs, one of the new backstrap weavers on Ravelry has been using the mug rug pattern charts here on my blog to weave sets of mug rugs. 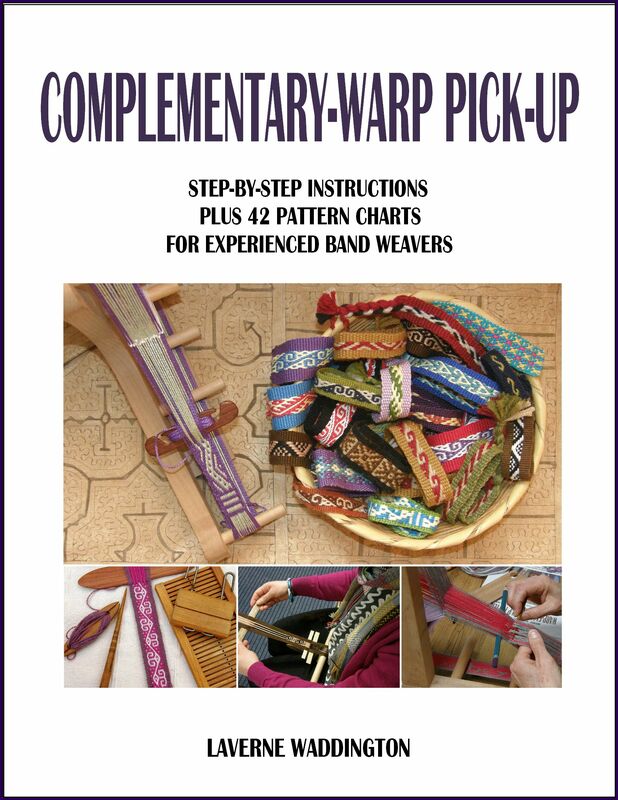 It’s nice to see those patterns being used along with the tutorial on double weave. Those mug rugs were a favorite project of mine all those years ago. They wove up so quickly and I still have them scattered all over my home. I took another silk book mark of the loom and used a 9-strand flat braid for finishing it. The green one was finished with a five-strand version. I call these my ”lazy” braids…one large braid that is quick to make as opposed to the multiple four-strand round braids that I usually like to do. I have a tutorial for the five-strand version here. The nine-strand one follows basically the same steps except that individual strands go over two and under two instead of over one, under one as described in the five-strand tutorial. It keeps all the fine ends of 60/2 silk nicely under control. In my last blog post I described my small test pieces for double-width fabric on my backstrap loom and lamented the fact that I didn’t have swords that were long enough to weave the width I want, around 23 inches, in a single layer rather than two. Well, it turns out that I do! My place is so small it is hard to believe that I could overlook something like this. I have a beautiful sword that goes with a backstrap loom from the Karen people that my friend Bhakti gave me. It would work beautifully on fabric up to 23 inches wide. I also have lots of Navajo-style battens from my tapestry days. They are long. 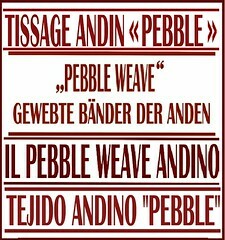 I used to weave 24-inch wide Navajo style pieces back then. These are, however, probably too narrow but would do in a pinch. And, I have four wooden one-meter length rulers that are the perfect width. They have been sitting in a tub alongside uncut broom handles for so long, I no longer even notice them. So, I think I am well set to cut and shape some nice long swords from those when I return to Bolivia. The Karen loom with its nice long split-beams and sword. So, that’s one for the to-do list when I get home. I also want to weave a shoulder bag with one of the cute pockets that highland weavers here incorporate in their coca-leaf pouches. These pockets are typically very small, about the width of two fingers. I want to weave a patterned wool bag with a much larger pocket that would fit perhaps my iPod, a notebook or other small item. I learned to weave these pouches with pockets in Potosi, Bolivia way back in 1997. Part of the fun of that project was learning how to decorate the pouch after I had finished weaving it. The bag was edged with a patterned tubular band. The pocket was edged with triple cross-knit looping. My teachers Julia and Hilda discuss how to set up the warp that includes the pocket. It had been many years since either of them had woven one of these bags. That’s me weaving the small pouch on the horizontal ground loom. And here’s the finished pouch with its little pocket in some of the lively colors of the highlands. I attempted to weave one these a few years ago. It resides in that tub of stuff under the bed that I told you about earlier! I had attempted it in cotton and quickly realized that cotton requires a lot more precision for this kind of thing than wool. For something like this, a bit of stretchy-ness is good! So, I have woven a miniature version in wool with a teeny tiny pocket. My notes in my journal on this back in 1997 are quite sparse. I am sure that I thought at the time that it was all just so obvious and not worth noting down. But, it was amazing how things came back to me when I hit the first obstacle in the process. Above you can see the wee pocket with some triple cross knit looping on the side. I need to practice that some more. 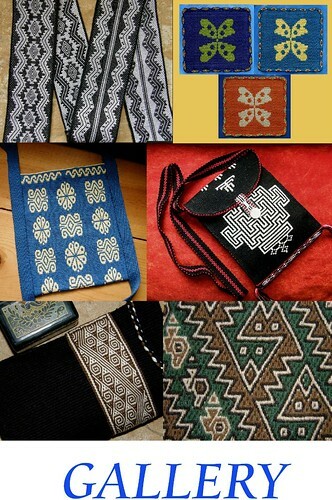 Some of these pouches have their pockets edged with tubular bands, like the one at left, and some have no edging at all but may have a small pom pom or tassel or added fringe hanging from them. So, that gives me a second project to come home to. I am hoping to weave the pouch with four selvedges, as is the tradition. I had also hoped to get some ikat experiments done during this time at home but that didn’t happen. And, to finish my taking-of-stock, it was fun to be able to finally edge the purple lap blanket and put it to use in what has been a winter with unusually lengthy periods of cold-ish weather. The double weave music band will travel with me as a sample for those who will be weaving double weave with me in Australia. I will leave you here with some news from Taproot Video. I am sure you must all know by now that Taproot Video is the home of my video class Operating a Backstrap Loom. Taproot Video offers its classes on dvd or as streamed content. The most recent offering is Carol James’ much awaited class on sprang braiding. 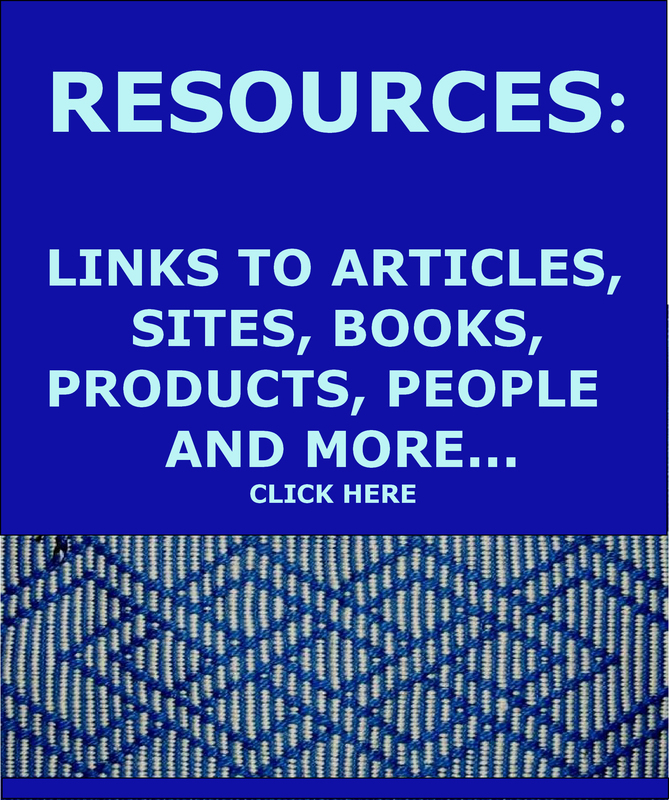 Carol has had a free video on the site for some time in which she teaches some of the basics. Now you can explore the topic further with her Introduction to Sprang. I haven’t tried it myself but I can’t see any reason why sprang wouldn’t work on a backstrap loom. One of these days I’ll do that…after I finish the wide silk piece and the wool shoulder bag and all the ikat experiments and and and…I hope my time at home later this year will see some book projects finished too. I hope to find time to write some “postcard” blog posts while on the road. Until next time! 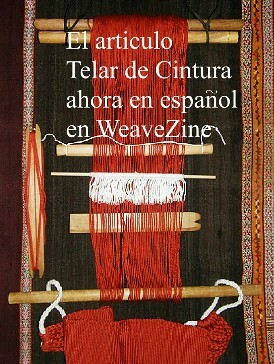 Wow, as always your weaving is so beautiful and inspiring! Safe travels…. Wow! I do a lot of barter with people but most people never actually send me the bartered item. I feel like I’ve hit the good luck lottery! The great variety of woven items really shows your skills and knowledge! I love those little pouches, and I’m glad you finished the music piece. I have been following the PAZA site, so was aware of Dorinda’s leaving. I will go to her blog and order something. I was thinking that the 5″ wide strip would be useful to make a long bag to carry my loom in, and I could make a carry strap for it with a yoga mat strap! You have a deep “stock” Laverne! Great, inspirational post as always. Thanks for all the ideas. I love the pocket purse especially. Travel well! I am blown away by your beautiful work. I have started backstrap weaving in the last few days because of you. I have found this blog and your videos and class very useful and enjoyable. Thank you so much for being a great teacher and source of inspiration. Thank you, Veronica. I hope your backstrap weaving is going well.